When summertime hits, a refreshing dip in the pool can be a welcome way to ditch the heat, of course after your pool has been cleaned from a sarasota pool service. But with temperatures well over one-hundred degrees, a relaxing swim can quickly turn ugly once that pool water heats up! Here are a few ways to cool down that pool and enjoy your summer. If you haven’t already, stop putting that cover on your pool at the end of the night. This traps heat and keeps the water toasty, exactly what we are trying to avoid. Although it may mean a little more time skimming those pesky leaves, this will make for a much more comfortable swim. Stagnant water is the main cause of pools staying too warm in the summertime. The heat is absorbed faster when the water is not moving and can cause raised temperatures very quickly. 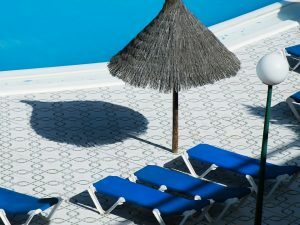 By running the pump in the evening, circulation will lower the pool’s temperature and keep it much more bearable in that triple-digit weather. This particular option can be a little pricy, as keeping your pump running can drastically affect your power bill. Fountains are not only fun for the kids to play in, and perhaps a few adults as well, but they also circulate the water wonderfully just as a pump would. There are many different sizes and options to choose from, and a water feature is quite easy to install on your own. Some float right in the middle of your pool, and others will attach along the side for your convince. The water is simply circulated right back into the pool, so this is a great choice for those looking to stay green. Much like a fountain, the aerator will lower your pool’s temperature around four degrees by recycling the water back into it. This is a fairly inexpensive way to beat the heat, although it is not quite as becoming as a water feature. 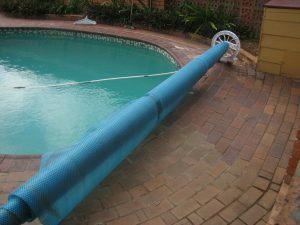 There are a few types to choose from depending on the size of your pool, and they also install quite easily, making this a very popular option. This option is a heftier investment than those previously mentioned, but will definitely cool your pool quickly and efficiently. It is similar to a pump in a way; the water goes into the cooler and bypasses a fan, lowering the temperature of the pool by as much as fifteen degrees. They do need to be installed by a professional and require regular maintenance, which is something to consider before taking the plunge and purchasing one. Shading your pool may not always be an available option, but it is a pretty good way of keeping the water cool. After all, if the sun does not hit the pool, it won’t warm it up! Planting trees around the area will help dramatically, but of course this requires time and maintenance. While it is a nice addition to any backyard, it is not always the simplest choice. If you are able to utilize an awning or large umbrella, this will work just as well. Of course, maintaining your pool is important to keeping it comfortable as well. Whether you need a filter, pump or upgrade, be sure to visit Grand Slam Pools for all of your pool needs! We do everything from pressure cleaning to lighting, and are quite affordable. Give us a call today, you will be glad you did!